The Metropolis concept likely will be built as the DS9 to become the flagship of Citroen's DS model line. SHANGHAI -- PSA/Peugeot-Citroen's joint venture with Changan Automobile Group plans to launch a new line of premium cars in China, says Gregoire Olivier, the company's CEO of Asian operations. The new joint venture will focus on light commercial vehicles and high-end cars. Speaking on the sidelines of an industry conference in Shanghai, Olivier told Automotive News Europe sister publication Automotive News China that the automaker plans to compete against the German luxury brands. 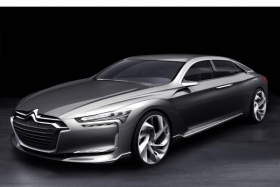 The new line will be based on the Metropolis concept car created by the PSA Design Center in China, he said. "The Metropolis will happen -- it will become a real car," he said. "The same styling elements will be used for a high-level Citroen car to be developed in China. We want to build up the premier line in China -- the Metropolis is emblematic of our approach." Olivier declined to give an production volume estimate or say when output may start. According to published reports, the Metropolis will be called the DS9, making it the flagship of Citroen's DS model line. The Metropolis is 5300mm long, 2000mm wide and 1400mm tall. It is built on the same platform as the Citroen C6 and Peugeot 407. It is the first car created by the brand's international design team, which has been based in Shanghai since 2008. The concept featured a plug-in hybrid powertrain. A 2.0-liter V-6 gasoline engine and an electric motor were mated to a seven-speed dual-clutch transmission. The powertrain generates 460 hp. However, it isn't clear what type of powertain the Chinese version of the DS9 will have. PSA executives have said they might withhold the hybrid version from China. The French automaker formed its partnership with Changan last July. The venture will use an assembly plant located in the southeastern city of Shenzhen in Guangdong province. The partners will renovate an existing assembly line and build a new line. The plant will produce up to 200,000 vehicles a year, according to the company's Web site. The plant will launch production in the second half of 2012. The joint venture also will have a technical center. The new company will be backed by an initial investment of 8.4 billion yuan (about $1.26 billion). In the first nine months, Citroen's sales in China rose 44 percent to 157,000 units. Ranked by unit sales, it is China's 18th-largest brand.